The spacious Prego looks relatively sombre and quiet through the huge glass windows as I peep into the boisterously colourful Italian restaurant. As I make my way through security and enter the lush open space where the mood is set in cheerful yellows and mustards with rust tones and natural wood, the commotion inside becomes apparent. The Prego, which is Westin Mumbai Garden City’s authentic fine-dining Italian restaurant, is a sheer sensory delight with its bright spaces, natural light, calligraphy, fine bar and exquisite wine display. 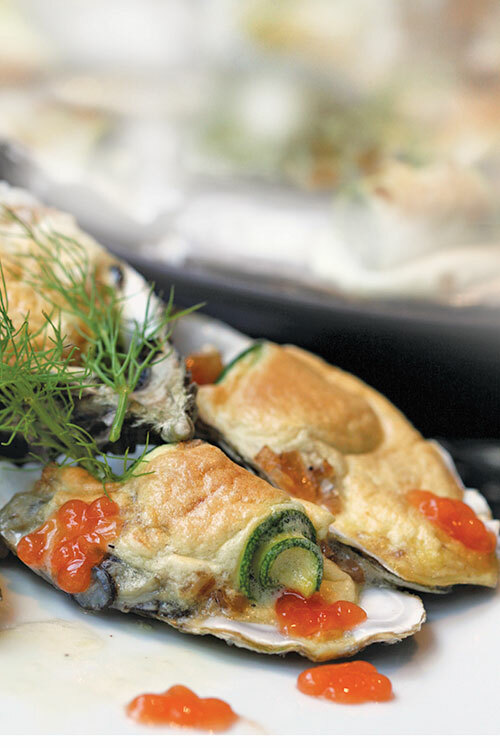 It is a perfect venue for the month’s jugalbandi with its luxe ingredient, oysters. The kitchen counter appears to be in total control for the day’s activity but Robert Conte, the executive chef looks a little befuddled as he walks around with his camera in one hand and coffee mug in the other. Apart from being the man in charge of the kitchen, he has also taken up the brave responsibility of being our photographer for this shoot. What started as a hobby for Conte soon morphed into a big passion. With time, landscape and food photography has become his forte and the chef has over the years honed this skill further. Not to miss is his witty side. Talk to him about anything under the sun, and he will have some funny anecdotes to share. But, for now, he has taken his role as a photographer a tad seriously and being the perfectionist he is, wants every shot to look perfect. I sit bemused as Chef Conte orders things around even as the other two protagonists of my story gear up with their paraphernalia for the big fat gastronomical storm that is about to be raised in this cosy kitchen. Amidst the disarray, the shy and reticent Chef Ashwini Kaw, one of the main leads, comes out from behind the counter to help clear the chaos. 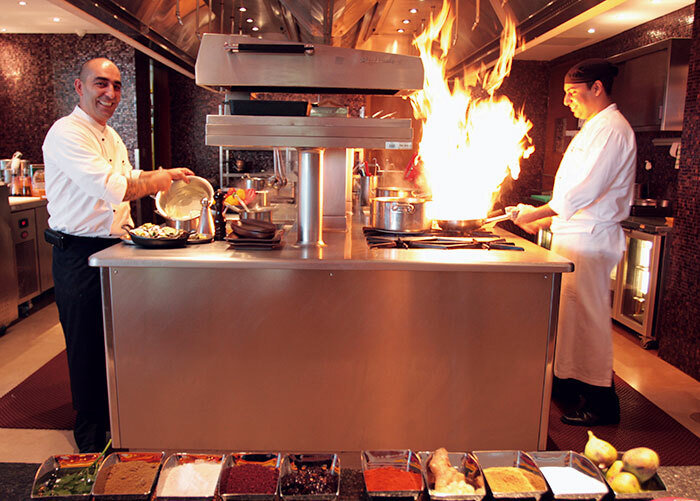 He hails from Kashmir and Indian food and curries, especially from North India is his specialty. Today he has decided to churn up the Indian classic pakora in his own versatile style with oysters. It would be an understatement to say that Kaw is passionate about cooking. To constantly think of innovative ways to improvise the overall taste and presentation of savories to appeal to one’s palate and eyes alike is his idea of spending an ideal day. 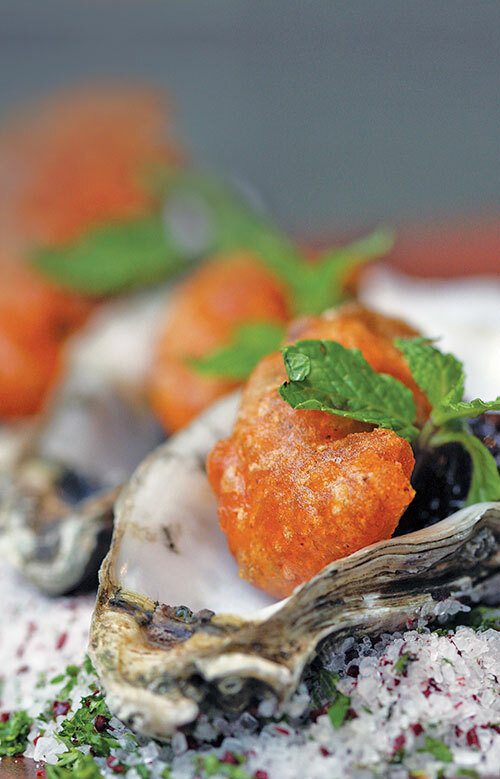 The oyster pakora is just another delectable nugget from his culinary cache. Just when I am almost impressed about his blinkered focus, men being men, Chef Kaw, animatedly starts talking about his other love, football, with the same zeal as cookery. When Chef Rossano Renzelli walks in, if it weren’t for the clothes with his name tag and the chef’s toque, his typical Italian-bloke looks and the rather huge and audacious skull tattoo on his arm would have anyone mistake him for a foreigner on vacation in Goa. Born and brought up in Italy, his wide smile is as refreshing as his specialty rustic Italian spread served hot in a contemporary style. Chef Renzelli tells me in his heavily Italian accented English that he is making salty oysters with zabaglione, a famous Italian dessert made of eggs, yolks and sweet wine. Cupid agrees that nothing could heighten the aphrodisiac nature of oysters more than this lethal love potion. As is common knowledge, mythology and history have always linked oysters to love and romance. Legend has it that Casanova, the dashing Italian debonair who had all the women swooning over him, would start a meal with a dozen raw oysters just to boost his sexual prowess. Chef Conte couldn’t agree more that the marriage of oysters au natural with dry champagne is the made-in-heaven union for his palate. In fact, these molluscs are perhaps the only seafood which people like raw for their succulent and luscious taste that best represents the briny sea. Chef Conte soon seems happy to have everything under control. The chaos has plummeted. Chef Kaw is ready with the marinated oysters giving out the characteristic scrumptious aromatic smell of freshly-grounded Indian spices. While we admire his feat, Chef Kaw gets the sweet and tangy combo of fig and berry chutney ready. This I realise will be the ideal accompaniment to our first appetising dish. Oysters he explains should never be cooked for long. Shock cooking is the way to go with them. And even before I can understand, the oysters are slid onto the hot oil and like their entry, their exit is just as quick. Shock and sweet indeed! Meanwhile, I catch Chef Renzelli as he pours a generous amount of zabaglione over the oyster stuffed with zucchini and the delicate meat. With his characteristic smile still in place, Chef puts the delicacy into the oven. A few minutes and voila! This sizzling hot spread along with its Indian styled counterpart is ready to be shot and instantly devoured thereafter! Oysters, 20 nos; Tempura flour, 120gms; Ginger garlic paste, 20gms; Carbonated water, 250ml; Kashmiri red chilli powder, 15gms; Kebab masala, 8 gms; Oil sunflower, 1000 ml. For fig and berry chutney: Chopped fresh figs, 400 gms; Blueberry, 200 gms; Strawberry, 200 gms, Roasted cumin powder, 10 gms; Black salt, 10 gms; Sugar, 50 gms; Lemon juice, 10 ml. In a clean sanitised bowl combine tempura flour, ginger garlic paste, carbonated water, Kashmiri red chilli powder and mix well to form a batter. On the side, marinate the oysters with salt, lemon juice and red chilli powder for at least 15 minutes. Place a small pot on the stove top and place the oil inside. Over medium heat pre-heat the oil to 170o C.
Coat the oysters with the batter and deep fry until done for about 30 seconds. Dry completely on a clean cloth and place back on the shells. Serve with fig and berry chutney. With a clean sanitised chopping board and a sharp knife, peel the figs, chop roughly and put in a bowl. Keep a sauce pan over fire and add figs, blackberries and strawberries. Cook together until bruised and slightly softened. Add sugar and black salt and continue cooking until the mixture thickens to the consistence of jam. Finish with roasted cumin powder. Oysters, 16 nos; Zucchini, 300gms; Shallot, 1 no; Egg yolks, 4 nos; Clarified butter, 50gms; Sparkling wine dry, 2 tsp, Rock salt; Salt fine; Pepper. Open the oysters collect the meat in a dish and wash and sanitise the shells. Peel the zucchini and cut into rounds. Blanch for 5 minutes in salted water, shock in ice water and dry completely. Over low heat melt butter in a pan and cook the zucchini and season using salt and pepper. Meanwhile roughly chop the shallots and set aside. Collect the egg yolks in a bowl, add chopped shallots and incorporate them using a rubber spatula. Dilute with sparkling wine. Now place the bowl with egg yolks mixture on a double boiler over medium heat. Using a whisk, keep the yolks moving and cook the mixture for about 10 minutes or until it thickens to a ribbon consistency. Be careful not to boil or overcook the mixture as the yolk will scramble and you will need to begin again. Once the mixture thickens, remove the zabaglione from heat and slowly incorporate the butter with the whisk a little bit at a time. Spread a layer of coarse salt on the bottom of a glass baking dish. Place each sanitised oyster shell with the opened side facing up and fill with a little zucchini and one oyster and then spoon a generous amount of the zabaglione over the oyster. Bake in preheated oven at 220 degrees for 4-5 minutes or until the top turns golden brown. Remove the baking dish from the oven and serve warm. A huge hit: Two billion pounds of oysters are eaten every year. Leading the race, Americans eat about 50 million pounds of these pearly delicacies in a year. Healthy is wealthy: Four medium-size oysters every day can give you the recommended daily allowances of calcium, copper, iodine, iron, magnesium, manganese, phosphorus and zinc. Pearls of wisdom: Only one out of 10,000 oysters actually produces a pearl in the wild. Most of the pearls created begin with human intervention. Oysters are what they eat: If your palate is driven by your visual senses then the colour of oysters’ meat depends on what they eat. Oyster connoisseurs take great pride in figuring out what regions the oysters came from just by their taste.